I am two weeks into my Amazon KDP non-fiction experiment. Guide to: Learning Python Decorators is currently #15 on the Python list as I write this, but was up at 5 during the week. It is aso #1 on the Python "Hot New Releases", which surprises me because #2 is a really strong title. Sales of both of my books have been slow and steady. I heard that the average "indie" author only sells 4 books/month. I'm happy to report that I'm slightly better than that and I will be receiving a check from Amazon this month ($100+ in sales). What else have I done this week? I have wondered about Amazon's lack of existence in BRIC (Brazil, Russia, India and China). When I had my own store front, I was able to sell to a few individuals from some of those countries. Now I am not because Amazon has no presence there. Again this is probably not something Indie fiction writers care about (with perhaps the exception of India) — I assume fiction is somewhat language dependent. But many programmers know English, so presumably I am losing some sales. How big would they be? I am not sure, but I have received at least one request from someone who claimed they did not have Kindle reader access. Currently my non-US sales are less than 10% of US sales. I am not sure if that is a function of my marketing, or how strong the Amazon presence is in those countries (UK, DE, ES, IT, FR), or some combination of the two. I also signed up for Amazon Author Central. Perhaps this will help with SEO, I am not sure, but I now have an author page, which also aggregates this blog and my tweetstream. 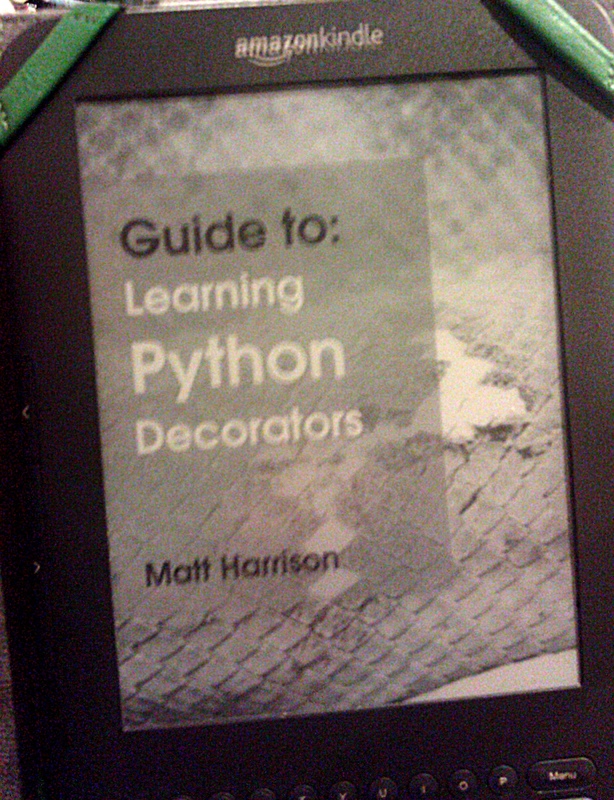 While at the Utah Python group this week, the first presenter actually mentioned my decorator book in his talk. When the meeting ended, an attendee informed me that he thought my book was pretty good (which he had purchased and was reading during the second presentation). Also he gave me some more feedback, which is always nice. I also spent some time looking into pbook generation. My calculation is around 4% of people would prefer dead tree books (very unscientific, consists of requests divided by current sales at some point in time). KDP only requires exclusive digital rights to your sales, not physical, so this is a very real possibility. But, my current pdf generation has issues and I starting learning LaTex to solve those. I hope to have some sort of dead tree versions released soon. I'm thinking about using CreateSpace, but would be open to using other POD services. If you have experience with POD feel free to drop me some notes. My book was submitted to the January 2012 Ebook Cover Design Awards, which was released this week. I was hoping to get some feedback on my cover, but did not. I interpret that response as an indication of the “blah”-ness of my cover. Not sufficiently interesting to warrant any praise, nor blatantly bad enough to expose the horrible design elements. Finally, a huge advantage to KDP, is I can easily push updates and Amazon handles everything else. A disadvantage is anonymity of purchases. With sales from my site, I had emails for all purchases and could interact with buyers, but pushing updates was a bit more of a pain. Some food for thought if you are considering one or the other. I really like to think that ebooks are somehow “alive” and that I can incorporate reader feedback very quickly and actually push it out, though this is not something that “real” publishers seem to be doing yet. I'm thinking that I might stay on KDP with my more expensive/longer Treading on Python which receives a higher percentage of "rentals", and make distribution of smaller ebooks more widely available — Kobo, my own site, and perhaps BN again.